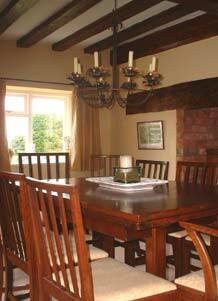 Yew Tree House is a pretty period cottage on a quiet country lane near Wymondham. 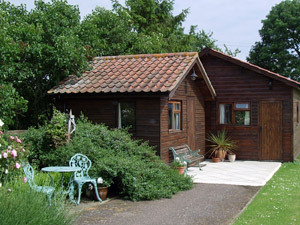 In a relaxed and informal atmosphere we offer bed and breakfast in two garden cabins each with private entrance, heating and en-suite facilities. 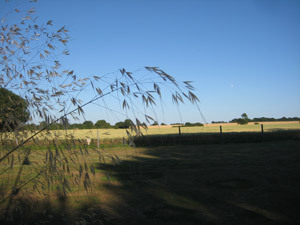 Both cabins have far reaching views over unspoilt farmland and our secluded lawned garden. Our location is ideal for visitors or contractors to Lotus Cars at Hethel or Hethel Engineering Centre. Room only rates a possibility. Lotus cars factory at Hethel. The University of East Anglia UEA and the Cathedral City of Norwich. 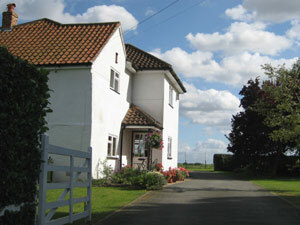 Within 30 minutes you can be at the famous Norfolk Broads or the East Coast beaches. Internet access. Flat screen digital television. Coffee and tea making facilties, small fridge. Hairdryer and iron if required. Extensive parking. Single rate £40 per cabin per night (£35 for 2 nights or more). 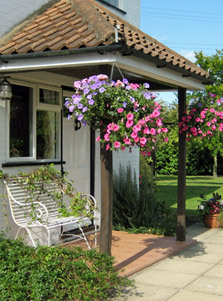 Double rate £70.00 per cabin per night (£65 for 2 nights or more). Room only rates a possibility, please contact us for favourable rates. Payment by cheque or cash please. Sorry, we are unable to accept cards. 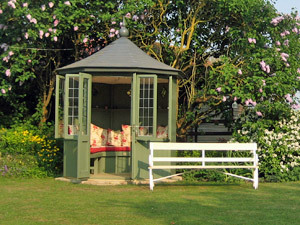 We also make and sell garden benches (as seen in the summerhouse photo). Click Bespoke Garden Benches for more details.